About a month ago my friend David sent me an email asking about how we could use the micro-blogging service Twitter to help spread the word and coordinate a swing dance festival that we were helping organize. We started brainstorming and decided to try it out. As it turns out, Twitter is a pretty effective tool for event organizers. I will describe in the post the three basic applications that we used Twitter for: public communications, volunteer coordination and tracking participant feedback. Perhaps it might help others out there thinking about how these micro-blogging services can be best leveraged to make your event as successful as possible. From May 21-25, 2009, about 2,000 dancers, musicians, and jazz enthusiasts descended on New York City from all over the world to participate in the Frankie Manning 95th Birthday Festival. Frankie Manning was a legendary swing dancer, a master of the art of lindy hop and an inspiration for thousands of swing enthusiasts globally. Sadly, Frankie passed away in late April, just a few weeks shy of his 95th birthday. The task of organizing the Frankie 95 Festival was monumental and unprecedented for the lindy hop community. A small army of volunteers were involved in an array of important responsibilities, from event registration, stage management, merchandise sales, housing, VIP relations, media and marketing, and transportation. The Festival principally took place at the Manhattan Center in midtown New York, but many events took place at venues around New York City, and participants and volunteers were being housed in dozens of hostels, hotels, and homestays spread out all over New York and New Jersey. So timely internal and external communications were key to the successful execution of the Festival. That said, our target population are not necessarily the most tech-savvy people. Unlike the folks who go to events like South by Southwest or E3 where Twitter use is very common, lindy hoppers span the range of technological sophistication – from total geek to near luddite. Many of our participants were from older generations of dancers, dating back to the original innovators of the dance who lindy hopped at the Savoy in the 30s and 40s. So it was a real question how our community would react to this cutting-edge communication tool. I will detail each of these in turn. Print: We created attractive flyers and posters that we arranged to have available at major lindy hop events around the country and internationally. Email: We did targetted email outreach to lindy hop organizers, promoters, schools, and website administrators. By early February, we had an email list of several thousand interested individuals that we could disseminate regular email updates to. Web: And we set up the website www.Frankie95.com to house the most important information about the event. Social Network: We created a Facebook event, messaged out to swing-related Facebook groups, and used the popular swing dance community site Yehoodi.com to connect with dancers from around the world. Viral Media: We created Flickr and YouTube groups to get people creating viral videos and photos around the Festival and sharing them with each other, to build excitement about the event. As the Frankie 95 Festival came closer, we realized that the Festival might benefit from having a more instantaneous means of reaching our participants. As much as email is convenient, being able to rapidly send out very short messages to several hundred participants seemed like a good idea. And the fact that Twitter is accessible via the web, through various free desktop and mobile applications, and via SMS text messaging meant that people could get the information in whatever way made most sense for them. Getting people to sign-up for Twitter was a pretty simple process. We just included in our email updates information on how to sign-up, pointing them to http:/twitter.com/Frankie95, instructing them to go through the registration process, and then “follow” the Frankie95 account. We encouraged people to add their mobile device to Twitter, so that they could be receiving updates via SMS text, even if they were not getting their email or accessing the web during the Festival. Soon after, we started using the Frankie95 account to send out timely updates to people, including registration deadlines, requests for help, and changes to the schedule. As people began seeing the value of the Twitter feed, they would “re-Tweet” the information out to their own followers, increasing the reach of our information and expanding the number of followers to our account. During the Festival, the Twitter feed was a very helpful tool for getting out instant information to our attendees. During much of the Festival, people were dispersed at various venues and locations throughout the city. And the evening dances were packed with entertainment. So there were very few moments when we could easily address the entire body of participants. If events were running behind schedule, we could tweet out that the a concert would start 45 minutes later than originally listed. Or when we were featured in a New York Times story, we could quickly get out a link to that article to our participants and others. To the right is an example of some of the tweets that we sent out to our followers. All told, we sent out nearly 100 public tweets in the run-up and during the Festival that reached 475 followers. Along side our public Twitter feed, we decided to experiment with setting up a private Twitter group for just our staff and volunteers to exchange messages. This was to supplement other channels of communication, namely cell phones, a small number of walkie-talkies, and face-to-face gatherings. The idea was to create a common channel that the main team leaders could use to stay in touch with each other at any time. Ideally, this would be something that a volunteer could just do for all of the other team members and then send them instructions. But we were able to get 29 of our key volunteers and staff to set this up for themselves, with some coaching from myself and David. During the event, staff and volunteers were able to tweet out messages to each other, such as “need more volunteers at front desk” or “security is being very strict about bag policy.” David also sent out encouraging messages to everyone during key parts of the Festival to keep everyone motivated. One last application of Twitter was as a way of tracking participant engagement with our event. We did this in two ways. First we could see who was re-Tweeting out information about the Festival to their followers. This was a good indication to us that we were providing info that they considered valuable enough to pass along. Secondly, we continually reminded people to use the hashtag “#frankie95” in their tweets, so that we and others could track the larger conversations going on about the Festival. This was a good way of finding out how people were reacting to the events, what media they were creating and sharing, and how they were feeling in general. luluhop: Still on a high from Frank95 and NYC! winterjump: Back from the fabulous $franie95 event in NYC. We are very inspired! KathleenHanover: Hellzapoppin dance contest finals from #frankie95. If you don’t gasp & grin, seek medical attention. Your heart’s stopped! cianna: Thank you to the entire @frankie95 team & all attendees@ That was an event to remember. You really did right by Frankie. We also could track videos and photos people were posting by searching on “Frankie95” on Twitter, Flickr, YouTube and elsewhere. So did people think that Twitter was valuable to them? I polled people over Twitter to see if they thought this was a useful service for them as participants or volunteers. Here are some of their reactions. thektron: "useful" isn't exactly the term, but in terms of "cool for keeping an eye on the event from afar", @frankie95 was excellent! peterloggins: yea, twitter updates rule! euromarianne: The twitter feed was a great idea and useful on the cellphone for updates during the day – could be even used more for surprises! The staff twitter rocked. Having immediate info helped a ton and helped coordinate movements for all of the staff who didn't have walkies and in general could in no way make phone calls due to the noise level. Plus when you needed to find someone ASAP, with the twitter feed you could have 40 other people on the look-out for you. It was very handy to be able to reach the entire group via phone messages, without having to enter a bunch of numbers. For urgent messages, that was ideal. (such as "looking for Joe" and "Joe on way" and "we need supplies in green room") The obvious flip side, however, was that I got a lot of non-urgent, non-applicable-to-me texts, which was rather irritating. It created an anxiety that i had to constantly check the phone for new tweets. Not useful at all. I think mostly because it wasn't used earlier and by the time it came time to use it I really didn't have the energy or time to set it up. I'd check the feed once a day but for the whole weekend I was on headset with the other people running tech so almost all the information I needed was through them. From my perspective as a floating helper, I found the team twitter account to be very useful. Since I wasn't part of anyone department, the feeds helped keep me in the loop of all areas of issue. I knew it wasn't what I would turn to if I wanted immediate response… used direct texting, phone or in person contact instead. It was also fun to be connected as a special team. Some of the tweets were quite humorous and provided a natural "bloopers" for the team. It would be interesting to know if the number of unnecessary phone calls were reduced. I'm not sure how we would measure the increased moral of having the small sense of control in the midst of many working parts (organized chaos). All-in-all, I would say our Twitter experiment was a success. We were able to get out targeted communications out to our desired public, we facilitated inter-team coordination that would have been difficult and expensive to do over other channels, and we tracked what people were saying about our event. Twitter doesn’t replace the need for a good website, email, and print media strategy. But it is a relatively simple and effective tool to increase your communications options for messaging various groups involved with your event. 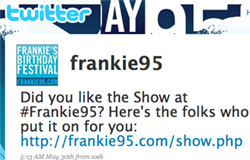 Lastly, this post was simply an overview of how we on the Frankie 95th Birthday Festival team used Twitter for our particular event, and is not meant to be an exhaustive outline of the various applications of Twitter for event organization. I’m sure there are other ways of using micro-blogging services like Twitter that we didn’t think of. And ways of doing what we did better. That said, I hope these ideas were helpful to you. Cautionary Note: The Swine Flu! While these new communications channels like Twitter and Facebook are useful for event organizers , they can also create opportunities for misinformation, flamewars, and other negative outcomes. A couple days after the Festival, we received an email from someone informing us that an individual may have contracted the H1N1 virus (also known as the “Swine Flu”) during the Festival. This person attended all of the major events and those potentially exposed hundreds and hundreds of people to the virus. We knew that we had to get ahead of this news and disseminate it as quickly as possible. Because it would only take one Facebook status post, one reply to a discussion board thread, one twitter update to cause a panic among our 2,000 participants. (“OMG, Frankie95 gave me the pig flu!”) We consulted with medical professionals, quickly crafted a carefully worded message ,and sent it out via email, the web and our Twitter feed, hoping that we were forestalling a health crisis. The crisis is not over, but I think our speedy and informed response averted a public relations and health nightmare. Thanks Rik! Certainly going to apply all this great information to upcoming events.